Those who are looking for an unconventional and fun social activity, are at least once, attracted to a LARP. Lately, the trend has become quite popular and finding a LARP that you like in your vicinity does not remain as a challenge. 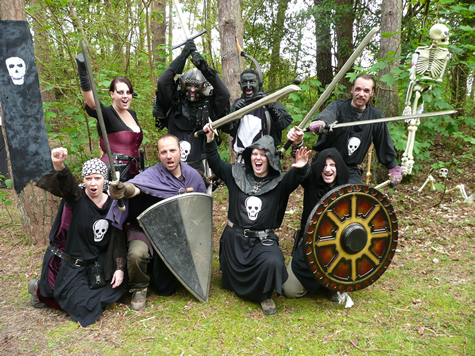 However, going to your first LARP can be a little scary, but once you are there, it is nothing but fun. Nonetheless, it is always advised to come prepared for the LARP as others are also investing their precious time into it. Nobody is going to kick you out if you mess up a dialogue or do something illogical. Everyone you are LARPing with was once a beginner and they understand that people make mistakes. This applies to everything. You do not need to have a perfect costume, or recite all your spells precisely on your first try. All that counts is that you are putting in the effort, and if you find that you are enjoying it, there is plenty of time to learn everything before the next event takes place. While LARPing is a lot of fun, it is never fun if you go unprepared. The least you can do is educate yourself with the lore, the settings, the story, and the rules. This will not only help you adjust and adapt more efficiently, it will ensure you create a character that will be perfect for the setting of the game. Make every effort you can possibly make in order to learn and remember the setting and the rules. As annoying as it might seem, as a lot of questions and clear any doubts that pop in your mind. In most cases, your fellow LARPers wouldn’t find it annoying and would appreciate any newcomers trying to learn the ropes. The best advice for first timers is to join the game as a NPC (Non Playing Character), to get a feel of the setting. This also helps with getting familiar with the rules of the game. If you want to join the game as a playing character, in most cases you get the freedom of creating your own character. Creating a character for yourself can be one of the most fun parts of LARPing. You can let your imagination run wild and create a backstory, personality and objectives for your character. Costuming and gear is an important part of LARPing. Since it is your first event, as mentioned earlier, you costume or gear does not need to be perfect. In fact, it doesn’t even need to be close to perfect. However, LARPing gear is quite cool, and one of the primary reasons people get attracted to LARP is the gear and the costume. If you are looking for gear, you can either make it yourself, buy it online, or from a thrift shop. There are a number of online sellers of larp costumes in UK that sell gear at reasonable prices. Before wrapping up, I would like to remind the readers that the main objective of LARPing is to have as much fun as you can. While there is certainly no shortage of fun activities in most LARP communities, stressing over how your first LARP will go may spoil the mood. It is thus best to never let go of the intention of having fun, and trying to learn as much as you can.